20/20 Dentistry (Philadelphia) - Book Appointment Online! 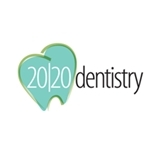 20/20 Dentistry is a Center City Philadelphia dental office where we provide up to date and comfortable preventative dental care to keep your teeth and gums healthy and maintain an attractive smile for a lifetime. From the basics of dental check-ups and cleaning to cosmetic dentistry, dental implants, or restorative care, our skilled general and cosmetic dentists employ the latest dental technology for outstanding quality in as few visits as possible. As experienced and caring dental professionals, we are dedicated to providing the best guidance and treatment available. Each person’s individual needs and circumstances will be addressed with respect and understanding. We carefully explain any recommendations so that patients can make well-informed decisions. We are devoted to the complete prevention and avoidance of dental diseases through education and encouragement.